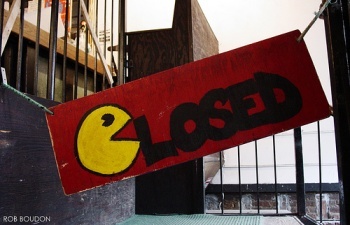 Namco Bandai is continuing to restructure to focus more on online and mobile games, but unfortunately that means "game over" for 90 employees in its U.S. office. Back in August, Namco combined its mobile and online games departments into one mega-division. Namco Bandai Games America and Namco Networks America became Namco Bandai Games America, headquartered in San Jose, California. But now, four months later, Namco announced that 90 positions in the San Jose office have become redundant. A representative from Namco said that the company was moving a lot of its videogame development back to Japan because the exact skills of the labor pool in America did not meet its demands. "We are partnering with external development studios out there because that is where the game business is going," said Namco marketing VP Carlson Choi. "Our goal is to move into digital games and broaden to different platforms. The details are being sorted out now." As always, The Escapist extends its sympathies to those who may have lost their jobs. It is never good news to hear. With many prominent Japanese developers quitting their longtime positions (Keiji Inafune and Shinji Mikami from Capcom and Katamari Damacy creator Keita Takahashi from Namco), you have to wonder if there is an ongoing culture shift in the Japanese videogame industry. Is Namco worried that Japanese videogame creators will become influenced by American culture like in the Michael Crichton novel, Rising Sun? Or is this simply a cost-cutting measure by Namco? In any case, we'll be watching the news from the island nation closely.